Who says only Donald Trump can do it? Clearly, our very own Yogiji can make a covefe of another level! An ardent follower of William Shakespeare and his gospel — “What’s in a name?” — Yogi Adityanath strikes again. Except this time, his gaze is fixed on West Bengal. Pre-election campaigning brings the cow crusader to West Bengal’s Purulia and CM Mamata Banerjee brings him on all fours. Err... wheels, we mean, wheels, since his chopper wasn’t allowed to land and he had to drive to the venue. But Yogiji’s spirit cannot be quelled, for it seems like he has been tweeting — and get this, in Bangla — all through his drive. There were speculations that Mukul Roy, ex-Trinamool and current BJP member, composed those tweets for him, but given the sheer number of spelling mistakes and factual errors in the tweets, we can safely put that speculation to rest. আজ দুঃখের বিষয় যে, আমাদের বঙ্গ আজ মমতা ব্যানার্জী ও তার সরকারের বিশৃঙ্খলার কারণে ভুগছে, এখন সময় এসেছে যে, শক্তিশালী গণতান্ত্রিক আন্দোলনের মাধ্যমে সংবিধান রক্ষা করার জন্য পশ্চিমবঙ্গকে এই সরকার থেকে মুক্ত করা উচিত. Tweet 1: Greetings to Bengal, the land of a glorious past and an extraordinary future. The land where the holy feet of Swami Ramkrishna and Swami Vivekananda fell, and which is the birthplace of Shyampa Prasad Mukherjee, founder of the Jan Sangha. 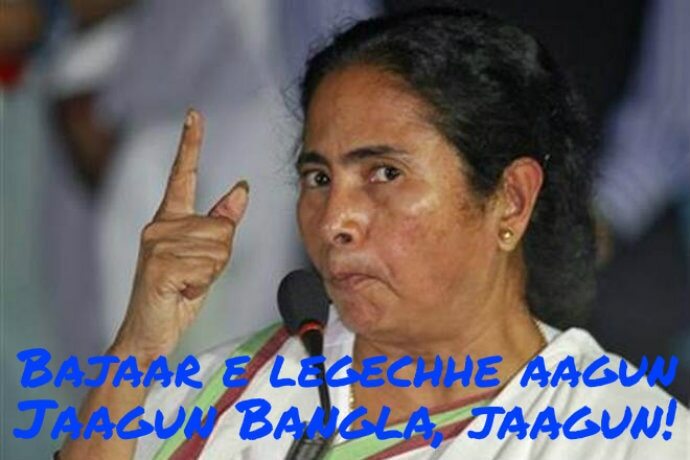 Tweet 2: Sadly, today our Bengal is suffering due to the chaos of Mamata Banerjee and her government. It is time now to liberate West Bengal from this government, to save the constitution through a strong democratic movement. Tweet 3: And that's why today I will stand against that corruption, with the flag of this movement, among all of you in Purulia. The thread that followed was evidently broader than the Bharatiya Janta Party’s thread of hopes of winning in Mamata land. Replete with spelling errors, one user gave up trying to 'right' Yogiji's wrong midway — simply because it was too overwhelming. Most, however, didn't even get it. But they loved it nonetheless. Full points for effort. But soon, Yogiji's cow-vefe...err...covefe — perhaps bigger than Narendra Modi's Kashmiri — caught everyone's attention. Who is Swami Ramakrishna Yogiji? It's only Ramakrishna.Tomorrow, Bengali newspapers will make a funny news out of it. The ploy did not go unnoticed. কাক ময়ূর এর পালক লাগালে ময়ূর হয়েযায়না, বাংলা লিখলেই বাঙালির মন জয় করাযায়না . Yogiji's advisors, clearly, soon caught up with the thread. And once he reached the venue, he swiftly switched to tweeting in Hindi — like he does best. Note how 'Swami Ramakrishna' was corrected to Ramakrishna Paramhansa in Hindi. Now, name changes do not bother Bengalis. Didi does enough of that herself. But she sure takes her Bong icons seriously. Will she let this covefe by Yogiji just go? We hope not.